The SailorXGenerator in its third generation! 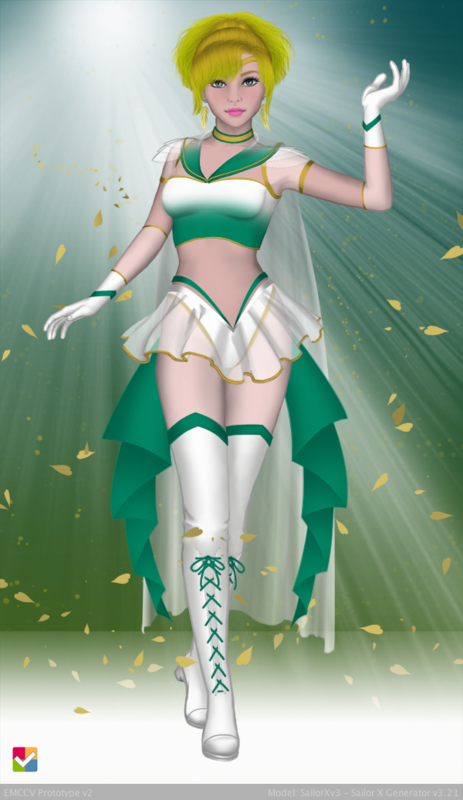 SailorXv3 is an ➚ module for generating an image of your very own otaku Sailor Senshi (fan Sailor Guardian) based on the anime/manga Pretty Guardian Sailor Moon ➚ by Naoko Takeuchi. 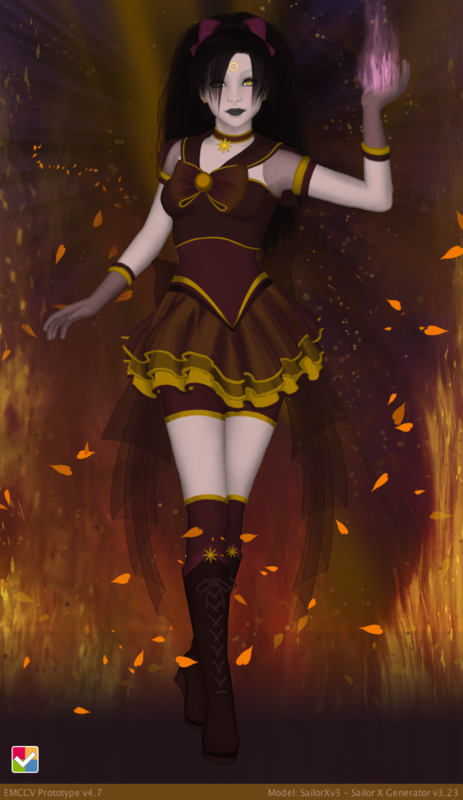 In contrast to the gorgeous anime style of the Senshi Maker by DollDivine ➚ the artwork of SailorXv3 offers a more realistic 3D style. SailorXv3 is FREEWARE (free to use and share). You will need the ➚, also FREEWARE. Resolution of 1024x768 or greater recommended. My name is Diana Thirring ➚, on the internet I go by "Aeryn Diana ➚" and some know me by my stage name Aeryn Martin. I like to sing ➚ on YouTube ➚, draw, write, watch documentaries, sci-fi and fantasy TV/movies and of course web-design and programming. I'm also learning to be a certified health practitioner. 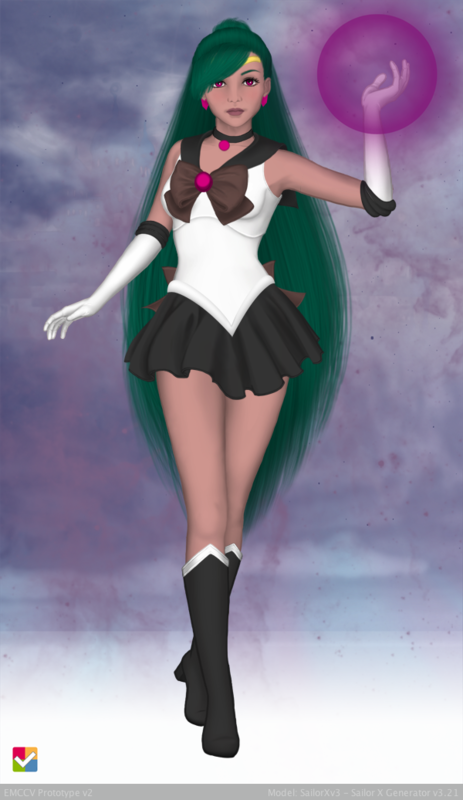 I've created SailorGalleries.com ➚, SailormoonFanart.net ➚ (both waiting to be reactivated/revamped), the more recent SailormoonFanart.com ➚, SailorX and of course the ➚. The background features "Sparkles" and "Rays of Light" were created with brush sets by Obsidian Dawn➚. 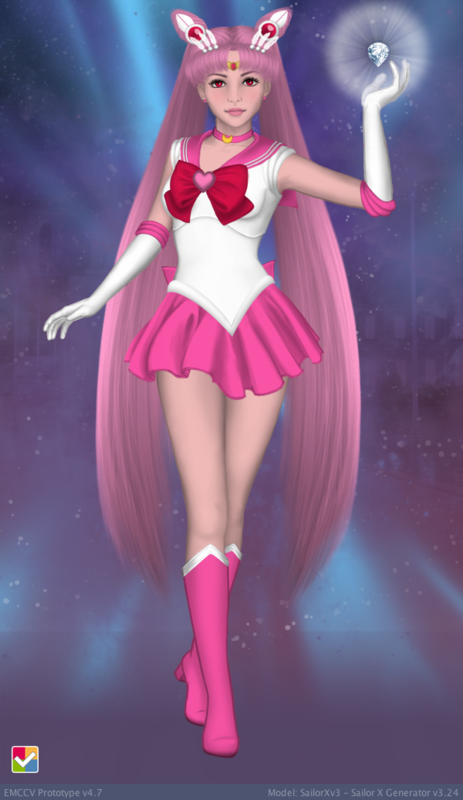 The Sailor X Generator was created by Diana Thirring, aka Aeryn Martin➚, inspired by Sailor Orion's Portrait Shoppe (offline), and allows you to create a picture of your otaku senshi (fan created guardian) based on the anime/manga Pretty Guardian Sailor Moon➚ by Naoko Takeuchi. With SailorX the focus is on the creation of new characters, rather than recreating existing ones. The interface is grey to avoid influencing the color choices of the user. The art style is more realistic than the original. SailorX has been around since 2002. 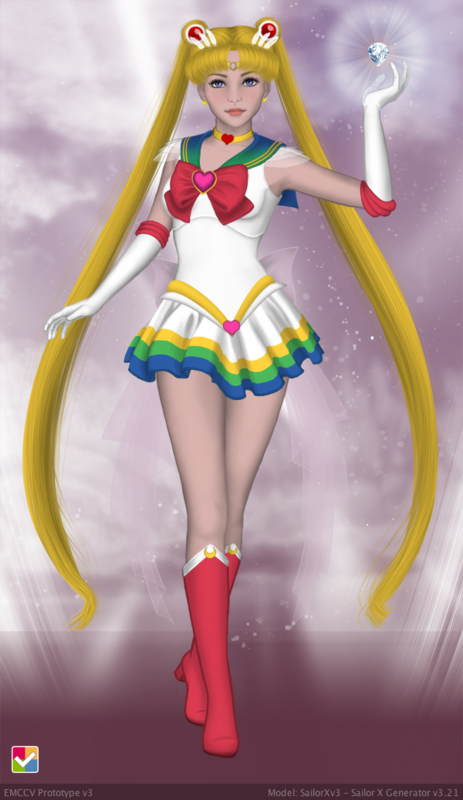 The first incarnation was simply called SailorX and later renamed SailorXbasic, after work on version 2 started. It was built for the already existing Kisekae Set System➚, short: KiSS. 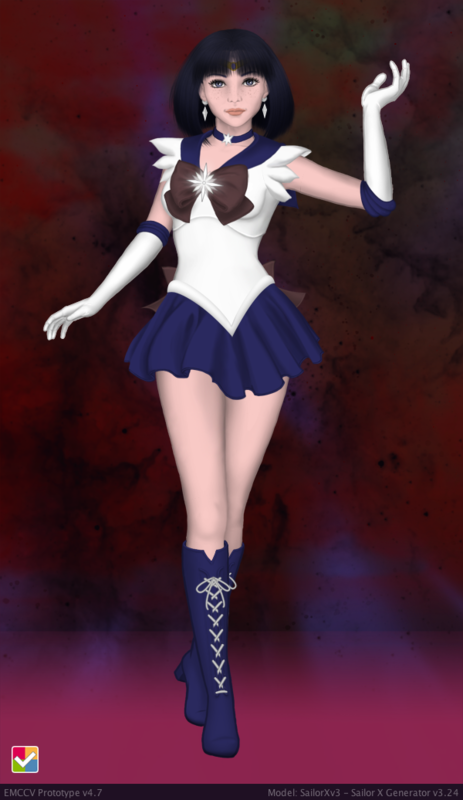 The base (body image) of SailorXbasic was created by Emby Quinn➚ and used with permission. 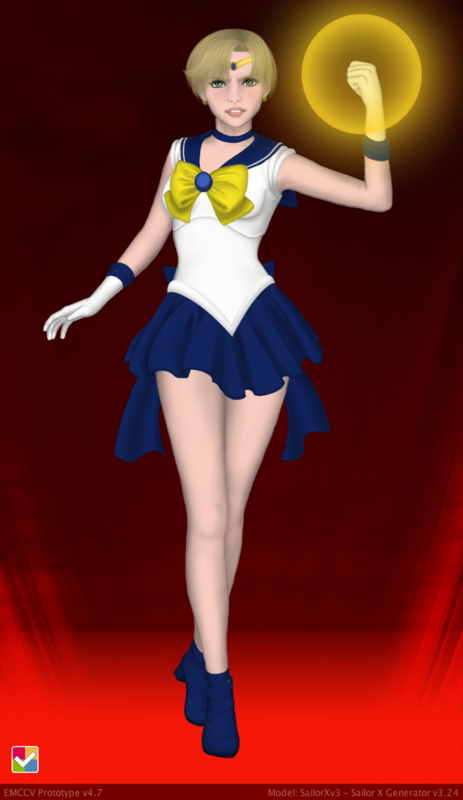 SailorXv2 was an improvement. The graphics were prettier and the color and costume options far greater. 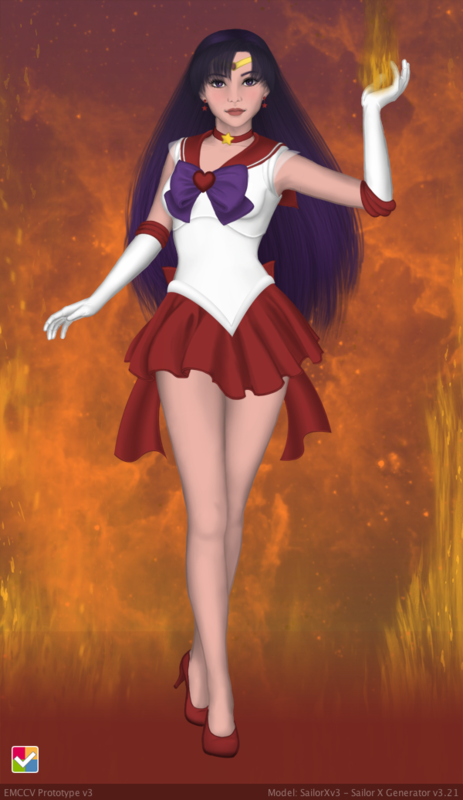 In fact, no other Sailor Generator had ever offered as many options. However, life got busy and updates ceased in 2009. 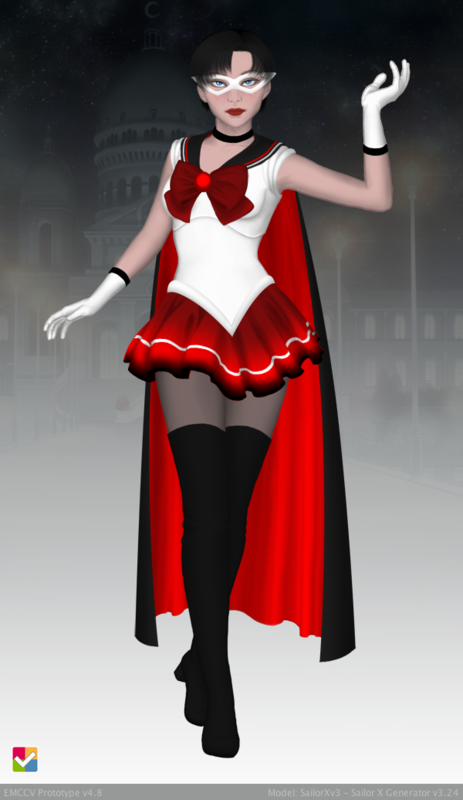 In the meantime Doll Divine➚ hired Drachea Rannak➚ for the artwork of a new flash based Sailor Generator, called the Sailor Senshi Maker, which took the number of options to a new level. 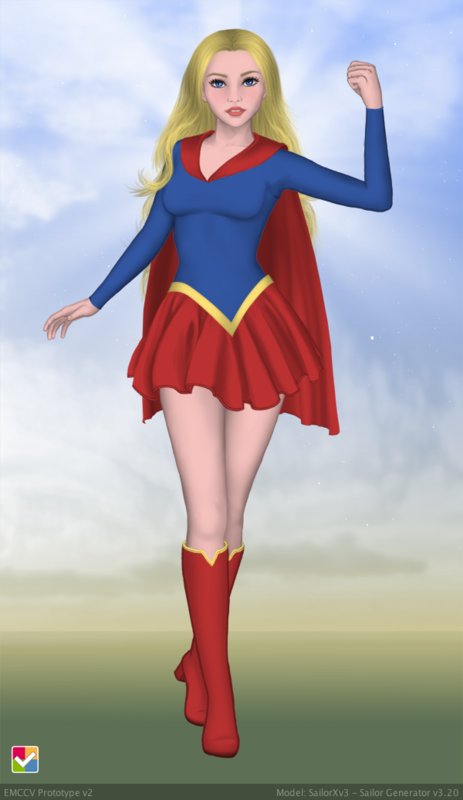 Inspired by this, plans for a new incarnation of SailorX started to emerge. 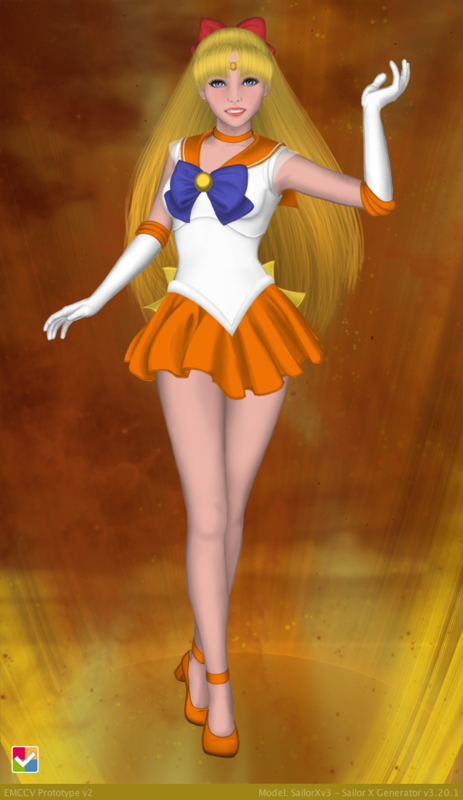 SailorXv2 was officially laid to rest when development on SailorXv3 began in summer 2013. 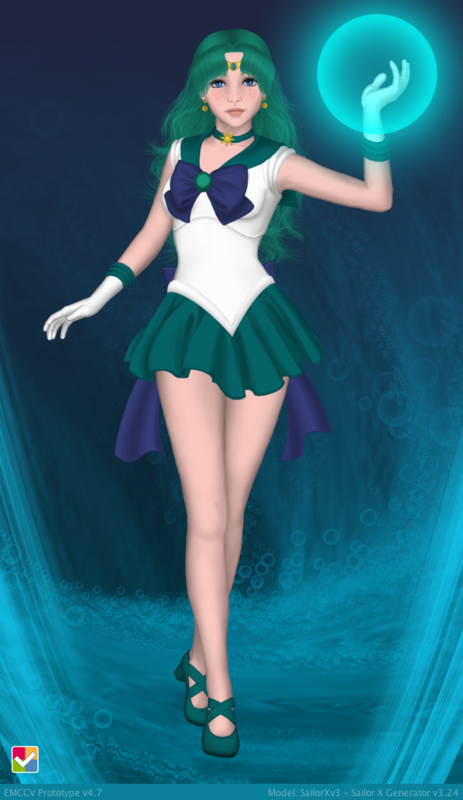 Drawing and programming skills had yet improved, so this time SailorXv3 was a standalone program (until version 3.18), and it would be the basis of the ➚, a new viewer-model system for creating image generators (or "doll-makers"). Items have smooth edges as images are in PNG format, which offers semi transparency. 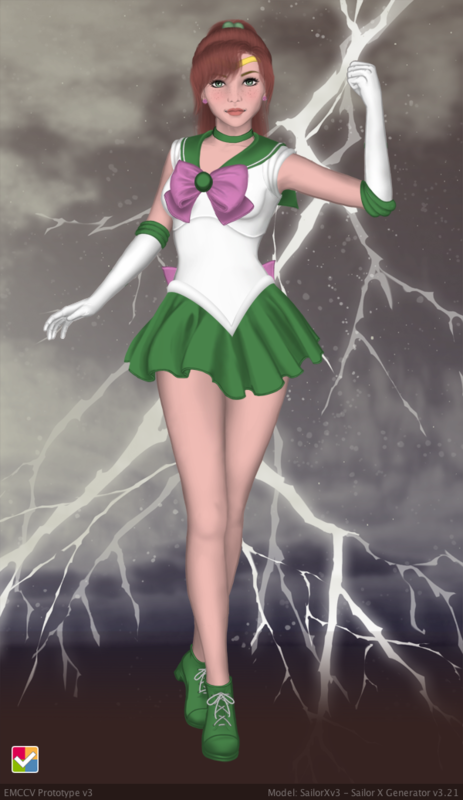 Today Sailorv3 is a module for the ➚. The Facebook➚ and especially the deviantArt➚ and Patreon pages will keep you up to date on new developments! These images were completely generated with the SailorXv3 module within the EMCCV Prototype. Of course you can get creative and create your own characters. 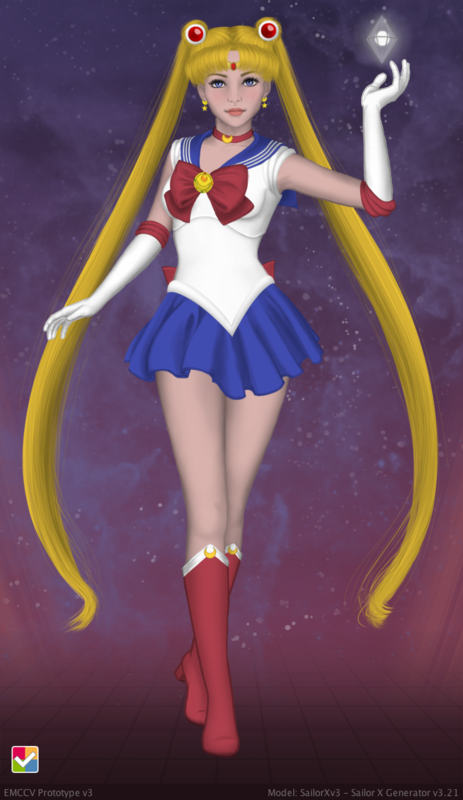 They don't even need to be senshi at all! Click the "Download"-Button above to download the SailorXv3 module (SailorXv3.zip). Unzip SailorXv3.zip. 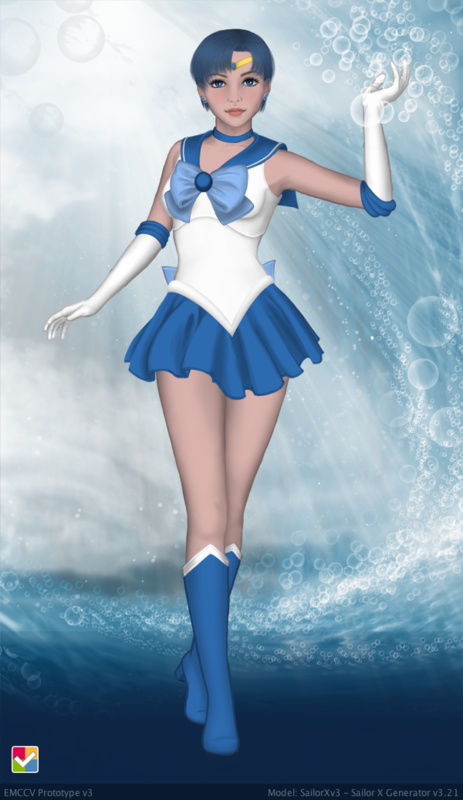 You should now have a folder called "SailorXv3" within the above mentioned directory. SailorXbasic and SailorXv2 are kisekae dolls. Therefore you will need to download and install an appropriate kisekae viewer. They are linked in the table headers below. If you are a Mac user then the only available KiSS viewer I know of is UltrakiSS. Updates and support have ceased, but I intend to convert these to the EMCCV format soon-ish. You can best reach me via Patreon ➚ & DeviantArt ➚. Your donations (starting at $1/month) get doubled as a credit for future premium content and your feedback counts extra! 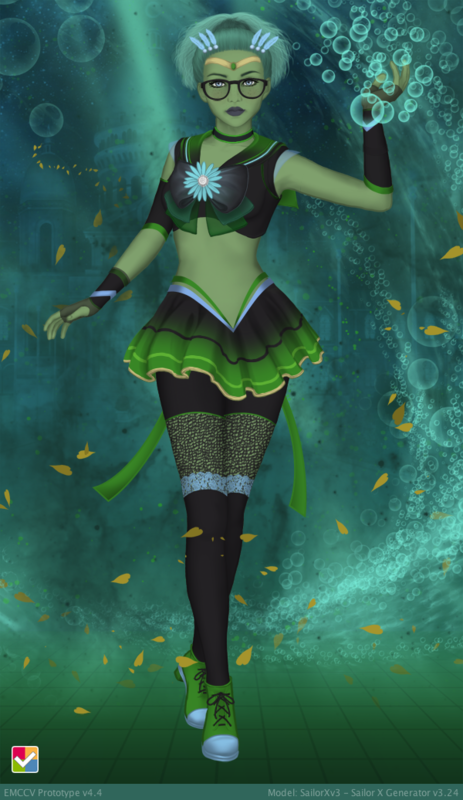 All proceeds go towards artwork for the Adult Female Humanoid (AFH) module, which is the basis for SailorXv4, and other themes like Star Wars, too! Please note that I only remember to check the group messages once a month or so. Best send me notes directly to the accounts, which I check almost daily. The official EMCCV channel ➚ with tutorials! The background features "Sparkles" and "Rays of Light" were created with brush sets by Obsidian Dawn ➚. © Diana Thirring (aka Aeryn Martin).